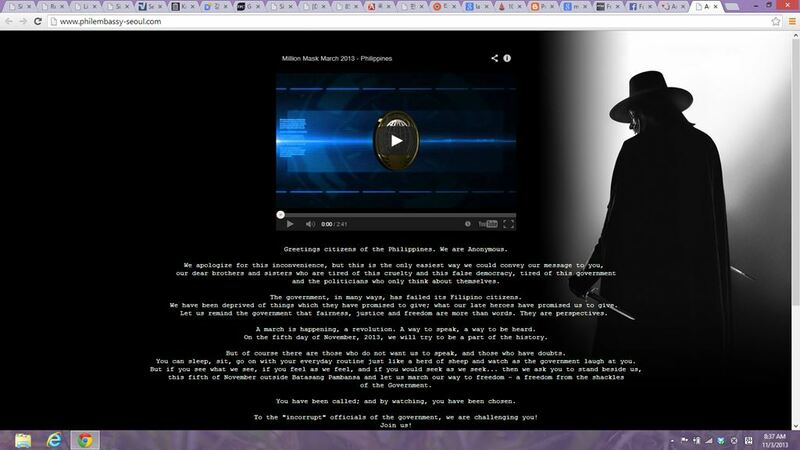 Philippine Embassy in Seoul website, hacked by Anonymous! The Philippine hacker group claiming to be “Anonymous” defaced the website of the Philippine Embassy in Seoul on Sunday morning. Instead of the usual information on the Philippine Embassy, the website (at this moment) has an embedded Youtube video. In its message, Anonymous, is inviting everyone to join the November 5th rally. As far as I can remember, this is the first time that the Philippine Embassy in Seoul’s website has been hacked. Philippine Embassy in Seoul website ~ defaced! I was even thinking of wearing the “Anonymous” mask (Guy Fawkes) to the Halloween party at the Philippine Embassy today. I guess that won’t be appropriate now.